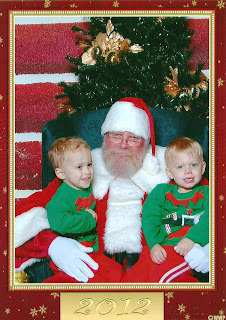 Unlike last year, this year there were no tears when it was time to visit with Santa. Reid was a little nervous, but Cort was chatting away with him. We saw Santa several different times this year. And the person who REALLY talked Santa's ear off was Pierce. He talked and talked and talked. He was asking Santa all sorts of burning questions about reindeer and rooftops and such. 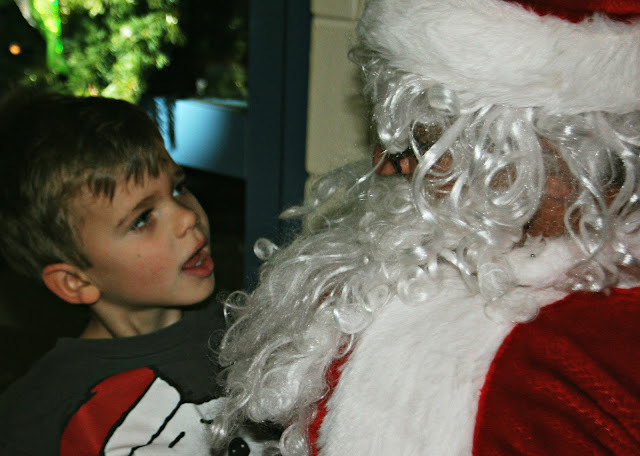 I was amazed he continued to spout out new questions with each Santa we saw. Finally, we had to drag him reluctantly away, as there was quite a line formed by the time he was done. The wonder of Christmas really comes alive for kids. I won't be blogging tomorrow, but I wish you all Happy Holidays! Love this.... it soooo made me smile. Merry Christmas to you and your beautiful family, Lisa! Hoping for some snow? Are you too? I adore your sons' Santa photos. Enjoy every minute of Christmas together! Merry christmas to you and your family Lisa !!!! Merry Christmas to you and your family, Lisa! I love the photos of your sweet boys and Santa. Merry Christmas! I just refound the envelope of picks you sent me! It was like finding a Christmas present. hug your kids for me. enjoy the holiday, dear lisa. That is so cute that he had so much he wanted to ask! hele fijne gezellige kerstdagen en een gezond nieuwjaar voor jullie allemaal. Oh how cute! It's nice when they don't get scared of Santa anymore. that last picture says it all!! i know all about those chatty boys and large lines forming...inquiring minds & all!! merry christmas lisa, this will be a fun one for you!! Merry Christmas. All the best to your and your family. Merry Christmas to you and yours. Have a wonderful time with the boys. Precious pictures, and that last one is just so darn sweet. I have really enjoyed reading and seeing this. Pierce really does have an intellectual curiosity, he will do great things when he grows up. Rock on, Pierce!! Awww -- I miss having little ones this time of year. Oh --what adorable photos... Love them!!!! So cute about Pierce! He must have a lot of curiosity. Hope you all have a fun time. a very merry christmas to you and your precious family!! Hoping you and yours have a wonderful day together to celebrate the meaning of Christmas ~ faith, family and friends. Cute kids. So precious. Christmas is not the same when children aren't around. Merry Christmas to you and yours!